U.S. Sen. Ed Markey, joined by Marty Walsh and local law enforcement leaders, unveiled a bill on Monday that would encourage states to follow Massachusetts’ lead on gun control and adopt policies like comprehensive universal background checks. The legislation, from the acronym-fond Markey, has been dubbed the Making America Safe and Secure, or MASS, Act. It would set aside grants from the Justice Department of $20 million per year that could be used to incentivize states to adopt measures similar to those in place here, where gun laws are among the strictest in the nation and where police chiefs are given broad authority to determine whether someone is given a license to carry a firearm. “Our gun safety bills are a model for other states and, I believe, for the United States Congress to follow,” Markey said Monday at an announcement at the Boston Police Department headquarters in Roxbury. As Markey noted, Massachusetts has the nation’s lowest rate of gun deaths. Among the measures Markey says he wants to see enacted in other states is the requirement that anyone who wants to buy a gun first be granted a license by law enforcement. Police chiefs in Massachusetts ultimately decide who is granted a license in their community, and can decide to revoke or suspend licenses from those deemed dangerous. The officials also said Monday they opposed proposals backed by the National Rifle Association to arm teachers in schools and allow gun owners with concealed carry permits issued in other states to carry concealed weapons nationwide, including into states like ours. Walsh, who joined Markey on stage, said he was encouraged by a wave of activism that has followed recent mass shootings and hoped to see action in Washington, even as modest gun control measures stall in the Republican-controlled House, Senate, and White House. Massachusetts has in fact become a leader in passing gun legislation. It became the first state to ban bump stocks after a shooter used one of the devices to kill scores of people at a concert in Las Vegas (only one other state, California, had banned them prior to the massacre). The ban took effect last month. The state also maintains a ban on assault-style weapons, and Attorney General Maura Healey has rankled gun groups by going after gun-makers that design weapons for sale in the state that violate the spirit of that law. Elsewhere, amid new activism for gun control following the school shooting in Florida students have staged school walkouts around Massachusetts to commemorate the massacre’s 17 victims. Many plan to walk out of school on Wednesday, March 14, then travel to the State House to lobby state legislators to pass a so-called “red flag” bill that would enhance the ability of family members to petition for guns to be seized from people deemed dangerous by a judge—legislation that has been identified as a goal by the Massachusetts Coalition to Prevent Gun Violence and is among few proposed gun control measures the state has not yet adopted. 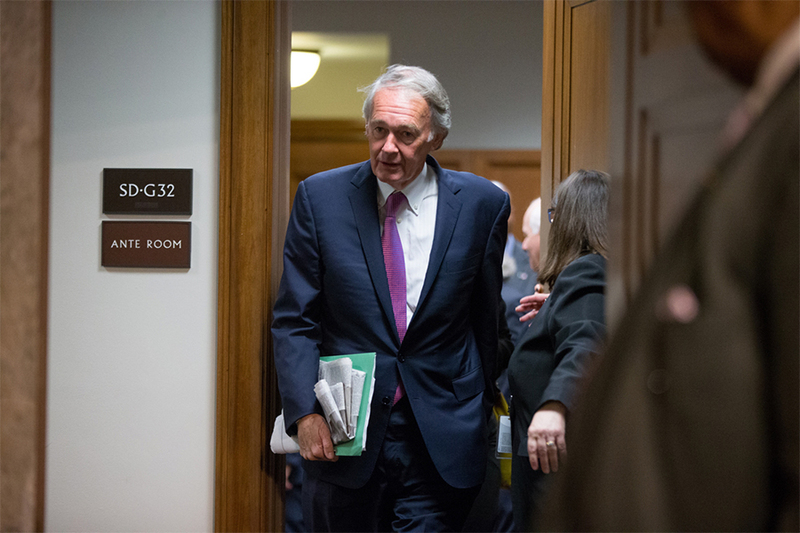 Markey has proposed several legislative fixes to gun violence in the past, including one that would require that firearms be fitted with “smart gun” technology, which is supposed to make it harder for someone to use a gun that does not belong to them. After proposing the idea in 2014 during Obama’s presidency, he reintroduced it in October after a gunman killed scores at a shooting in Las Vegas.